An 11th-inning RBI double by West Valley College second baseman Mike Svozil was the ultimate down for American River College’s 12-11 loss in an up and down game Saturday. ARC was led by shortstop Jared Biggs, second baseman Robert Contreras, and first baseman Kirby Broadbent, who each had two RBIs in the loss. Right fielder Cade Parker had an RBI, scored three runs, and went 3 for 5 on the day. It was the inconsistency of the pitching, however, that has been ARC’s weak point through the first two games. Pitching coach Preston Vancil was not happy with the performance of the guys on the mound. Vancil said “walks and hit batters” were the biggest reasons for the early-season struggles of the pitching. ARC allowed an astonishing 11 walks from its five pitchers in the game, with starter Andrew Wiesenfarth responsible for 6 of them. Wiesenfarth also hit a batter, while reliever Ian Codina hit three over the course of his outing. “They (the pitching rotation) are far too talented to be walking this many people,” Vancil said. Tommy Balmain, who came in to relieve Wiesenfarth, went three innings and allowed 3 runs (1 unearned) on 2 hits with 2 strikeouts, but walked 3. Balmain said they key for the pitching staff going forward was to get first-pitch strikes. Though offense has put up 17 runs through two games, it doesn’t have a win to show for it. “Obviously it’s a little bit disappointing but we know what our pitchers are capable of doing and I think they’ll start executing as the season goes on,” said second baseman Biggs. Biggs added that “pitch selection” was the number one reason the offense has looked so good in the early going. Sophomore center fielder Justin Jordan agreed that the losses have been disappointing, but that the team can’t think with that mentality if it wants to be successful. 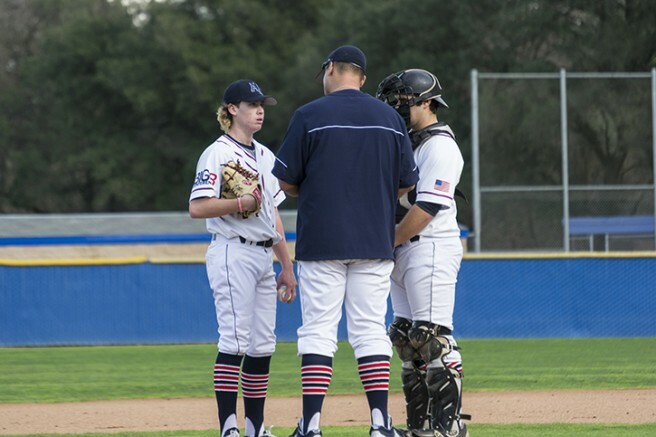 Jordan injured his hamstring stealing second base in the eighth inning and was removed from the game, but said he should be ready for the team’s next game Thursday vs. Shasta College. “I asked the umpire if I was safe, and he said ‘yeah, you’re safe,’ and I just thought ‘then I’m good,’ “ Jordan said, despite being injured on the play.. Dating back to the 2014 season, ARC has now lost six in a row to West Valley. Thursday’s matchup against Shasta is at 2 p.m. at Beaver Field. Be the first to comment on "ARC falls in extras, drops to 0-2"